Hard Questions For "Prosperity Gospel"
Last November, Sen. Charles Grassley launched a public investigation into the ministries of six top televangelists who attract thousands of followers and collect hundreds of millions of dollars around the world. Grassley is demanding financial records to determine whether these churches deserve their tax exempt status. CBS News chief investigative correspondent Armen Keteyian takes a hard look at one target: Kenneth Copeland, the so-called "godfather" of "prosperity gospel." "To live in the garden of Eden … hallelujah!" Copeland says. "Somebody shout 'amen!'" In one TV sermon after another, Kenneth Copeland and wife, Gloria, implore viewers to sow the seeds of their faith by following God's word - and donating dollars, promising a 100-fold return in happiness and wealth, Keteyian reports. Even the check envelope says "I am sowing $_____ and believing for a hundredfold return." "It's a business, it's a bottom-line business," said a former ministry employee - who feared being identified. The employee answered hundreds of prayer requests a day, most sent in with donations, before quitting, feeling "betrayed" by Copeland's gospel of prosperity. "So when he's preachin' health and wealth..." Keteyian asks. "He's filling that bottom line on his business," the source said. That's why Senate investigators are digging into whether ministry resources are being diverted into an array of for-profit companies tied to the Copelands: cattle, horses, aviation, real-estate development and gas and oil wells to name a few. Michael Hoover, who worked for Kenneth Copeland Ministries for five years, quit in 2005 over disagreements with the church. He says he witnessed other employees doing work on behalf of for-profit businesses tied to the Copeland family. "In my viewpoint, I believe that they were using a lot of the ministry's assets for personal businesses," he said. "The nonprofit activity and the for-profit activity are so intertwined that you can't, you can't separate them," said Ole Anthony of the Trinity Foundation. A two-month CBS News investigation, including interviews with nearly a dozen former Copeland employees, raises serious questions about the Copeland's religious empire. Beginning with a lavish lakefront home, all 18,000 square feet of it, and a fleet of private planes - all paid for by the ministry. At a celebration, Copeland said: "The Lord spoke to me and said 'you're gonna believe for a Citation 10, right now.'" Copeland got what he wanted - that's the $20 million jet right there parked at the ministry-owned airport. It's one of four private planes owned by the church. "It will never ever be used as for anything other than what is becoming of you Lord Jesus," he said. CBS News has learned he used one ministry jet and another to fly to and from Colorado three times in 2007 - the site of frequent Copeland family vacations. The ministry now claims they reimburse the ministry for personal use of the jets. Copeland has said: "You are not created for poverty." Learn more about Copeland and televangelist funding over at Primary Source. Churches are not required to file tax forms - or make their finances public. The ministry, which says it does everything by the book, has refused to answer key questions about its finances raised by Senate investigators. "We answered them - we gave them a several-page lesson on …" Copeland said. 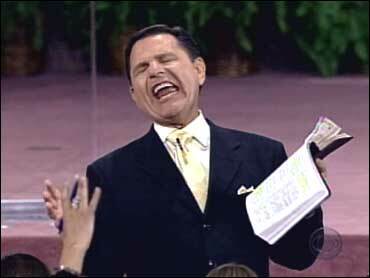 Kenneth Copeland refused repeated interview requests by CBS News. When Keteyian went to ministry headquarters near Ft. Worth, Texas, we were turned away. "There's no way I can see him right now?" Keteyian asked a security guard before being turned away. If Grassley doesn't get the answers he wants, he may well resort to some words of his own - in the form of a Senate subpoena.